The Airport Authority Hong Kong (“AAHK”) is responsible for operation of the Hong Kong International Airport (HKIA). The HKIA Master Plan 2030 (MP2030) recommended expansion of HKIA into a three-runway system (3RS) (“the Project”) as the best way forward to cope with the projected increase in air traffic demand and to secure the continual growth of HKIA operation for the benefit of the economic development of Hong Kong. 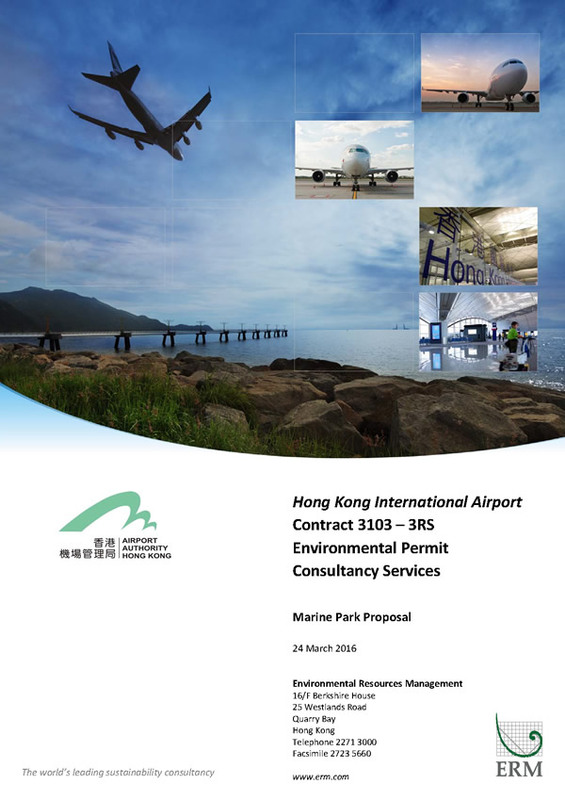 This development option for HKIA received approval in principle from the Government of the Hong Kong Special Administrative Region (HKSAR) on 20 March 2012. An Environmental Impact Assessment (EIA) Study Report for the Project was prepared in accordance with the study brief requirements (ESB-250/2012) issued by the Environmental Protection Department (EPD). The EIA Report for the Project (Register No. AEIAR-185/2014) was approved by the EPD on 7 November 2014 and the Environmental Permit (EP) (EP No. 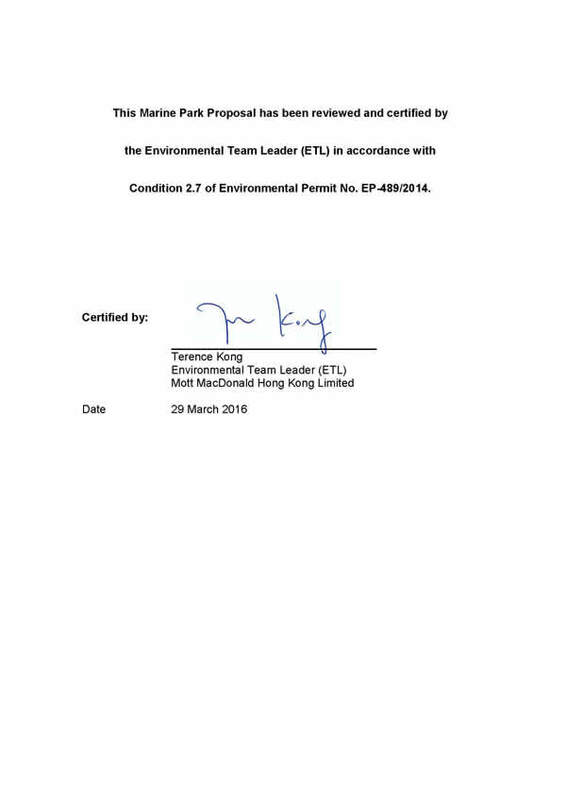 EP-489/2014) granted on 7 November 2014. As recommended in the approved EIA Report, the AAHK proposed to establish a new marine park which would comprise an area of approximately 2,400 ha as compensation for the seabed habitat and open waters habitat loss associated with the land formation for the 3RS Project. The new marine park is proposed to provide critical linkages between the current Sha Chau and Lung Kwu Chau Marine Park (SCLKCMP) and the proposed The Brothers Marine Park (BMP). It is anticipated that the establishment of the new marine park would protect and conserve the marine environment around the HKIA from various anthropogenic threats such as sewage discharge, seabed dredging, dumping, coastal reclamation and destructive fishing. In addition, it is expected to improve the conservation of Chinese White Dolphins (CWDs) by mitigating the impacts of habitat loss, habitat fragmentation, changes in patterns of habitat use, as well as minimising the noise and disturbance from marine traffic, specifically high speed vessels traffic. · Incorporation of enhancement measures including but not limited to deployment of artificial reefs and release of fish fry. Prior to undertaking the preparation works for marine park designation, in accordance with EP Condition 2.7, the AAHK shall prepare a Marine Park Proposal, including the proposed size and management plan of the marine park as recommended in the approved EIA Report, in consultation with the Agriculture, Fisheries and Conservation Department (AFCD). 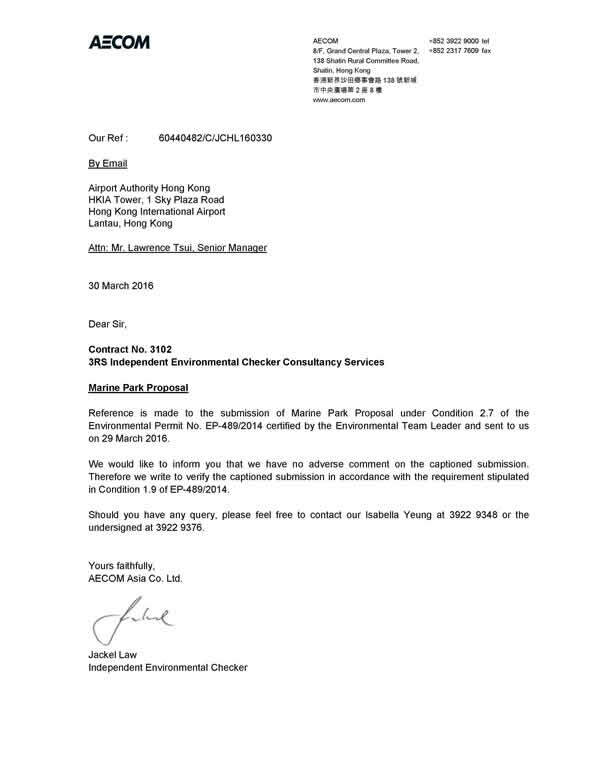 The Marine Park Proposal shall be submitted to the Advisory Council on the Environment (ACE) for comment before submission to the Director of Environmental Protection (DEP) for approval no later than 3 months before the commencement of reclamation related marine works of the Project. In addition to being a mitigation measure for the 3RS Project for the conservation of CWDs, the proposed marine park (“3RS Marine Park”) will share the same vision of all marine parks in Hong Kong, which is to protect and conserve the marine environment for the purposes of conservation, education and recreation. For the effective implementation of the 3RS Marine Park against this vision, SMART (specific, measurable, achievable, results-focused, and time-bound) goals and management targets will be developed as part of the detailed study. These will be developed in consultation with relevant stakeholders including fishing industry, green groups, non‐governmental organizations, marine industry, marine users, boat operators, relevant District Councils, advisory committees such as the Country and Marine Parks Board, Marine Parks Committee, Marine Department’s consultative committees such as Port Operations Committee, Local Vessel Advisory Committee and High Speed Craft Consultative Committee, and the ACE, community groups, as well as the authority to ensure that they tie in with the needs and aspirations of the range of users of the marine park. AAHK will work with AFCD to ensure effective implementation of the 3RS Marine Park through the development of SMART goals and management targets as part of the detailed study. AAHK will carry out the detailed study on the preparation works for marine park designation and lead the associated stakeholder consultation activities, with the support and participation from AFCD throughout the detailed study. As the Authority under the Marine Parks Ordinance, AFCD will be responsible for the designation, management and operation of the 3RS Marine Park. A Liaison Group involving AAHK and the AFCD is proposed to be set up to facilitate direct and ongoing liaison with AFCD with a view to adding value to the management of the 3RS Marine Park after its establishment. Separately, under the environmental monitoring and audit (EM&A) programme of the Project, AAHK will conduct CWD monitoring to assess the effectiveness of the proposed marine park as a mitigation measure for the Project. Data collected will be shared with AFCD. This Marine Park Proposal presents the proposed location, layout, size and management plan of the 3RS Marine Park to be established for the compensation of the marine habitat loss associated with the land formation for the 3RS Project for protection and enhancement of CWD habitats in western Hong Kong waters as well as mitigating the impacts to CWDs on habitat fragmentation, changes in patterns of habitat use, as well as minimising the noise and disturbance from marine traffic, specifically high speed ferries. It is important to note that the recommendations presented herein are preliminary in nature and will be amended and refined subject to the outcomes of the detailed studies and stakeholder consultations to be undertaken during the preparation works for the designation of the 3RS Marine Park. Section 4 presents the way forward for the preparation works for the designation of the 3RS Marine Park. As recommended in the approved EIA Report, the proposed 3RS Marine Park would comprise an area of approximately 2,400 ha and provide critical linkages between the current SCLKCMP (an area of ~1,200 ha) and the BMP (an area of ~850 ha at the time of EIA reporting). Together, all three marine parks would make up about 4,450 ha of protected areas for CWD. Figure 2.1 presents the indicative boundary of the proposed marine park matrix scheme included in the approved EIA Report and the EP (), and provides the basis on which the proposed size and boundary of the 3RS Marine Park are prepared under this Marine Park Proposal. It should be noted that the preliminary boundary of the proposed 3RS Marine Park shown below in Figure 2.4 is provisional at this early stage. The exact boundary shall be subject to further investigation in the detailed study on the proposed marine park scheduled to commence upon approval of this Marine Park Proposal. Under the detailed study, consultation with stakeholders and relevant advisory committees will be conducted and their views will be solicited before finalising the marine park boundary and size. Further refinement on the boundary and the proposed 3RS Marine Park size may also be made taking into account the information on CWD distribution (both historical and up-to-date recent data), key marine habitats and species, marine traffic, existing facilities and planned developments in the vicinity of the 3RS Project area available at that time. In addition, the boundary may also be adjusted in consideration of marine park operation and enforcement point of view. Ecological connectivity is important to the efficacy of conservation as it facilitates the dispersal and movement of organisms, to re-colonise or persist in the habitats. A study has shown that linkages between marine protected areas (MPAs) are effective in allowing movement of cetaceans from one protected area to another (). In addition, it is generally recognised that MPAs are most effective when they are large in relation to the ranges of the protected animals and they work best when they can provide linkages between areas of core habitat for important life functions (). It is also considered that MPAs which exclude fishing at core area and anthropogenic disturbance may benefit the adjacent marine ecosystems outside the MPAs through the net emigration of juvenile and adult fish (“spillover effect”) and / or export of pelagic eggs and larvae from the restored spawning stocks (). The spillover effect could be strengthened through fisheries management measures within the MPAs, e.g. fisheries no-take zone, maintain an appropriate level of fishing effort, etc. to provide important protection for fisheries resources and marine mammals. Therefore, MPA connection and fisheries management measures (to be discussed in Section 3.4) could provide synergistic effects for the conservation of marine ecological and fisheries resources within the MPAs and the adjacent marine ecosystems. The MPAs situated at the northern and western Lantau waters and adjacent PRE waters for the protection of CWDs are presented in Figure 2.2 and discussed below. The SCLKCMP is situated in western Hong Kong waters with a total sea area of about 1,200 ha. It was designated on 22 November 1996 for the protection of CWD and fisheries resources. CWDs were generally recorded on the eastern coast, the northwest and southwestern tips of Lung Kwu Chau; and near the northeast and southwest coast of Sha Chau. The findings of the long-term dolphin monitoring programme undertaken by the AFCD suggested that the SCLKCMP have served as important dolphin habitats with their frequent occurrence in northwestern Lantau waters (). The SCLKCMP is also rich in fisheries resources and is an identified spawning grounds of commercial fisheries resources. The BMP is a mitigation measure proposed under the EIA study of the Hong Kong Boundary Crossing Facilities (HKBCF) Project for the conservation of CWD and enhancement of marine resources. It is situated around the waters of Tai Mo To and Siu Mo To, covering about 970 ha of sea area. The increase in area (from 850 ha) is in response to the review of long-term CWD data and the recent nearshore theodolite tracking data at North Lantau as well as the comments received from the stakeholder consultation conducted in 2014-15 (). The waters in the vicinity of the Brothers Islands is one of the heavily utilized dolphin habitats in Hong Kong according to the findings of the long-term dolphin monitoring programme undertaken by the AFCD (). However, as reported in the AFCD long-term dolphin monitoring conducted in 2012-13, some identified CWD individuals appeared less frequently near the Brothers Islands than in earlier years which coincided with the overall general abundance decline in northeast Lantau waters (). The BMP also contains scattered coral colonies around Tai Mo To, area of moderate fisheries value and important spawning grounds for commercial fisheries resources. A zoning scheme which consists of one Core Area and two Anchoring Areas has been proposed in the BMP management plan for the protection of marine habitats and species while minimizing conflicting uses by different park users. The AFCD aim to complete the statutory procedures for designating the BMP by end of 2016. The PRECWDNNR was established in 1999 and upgraded to national level in 2003. It is located in the north of the Pearl River estuary with sea area of 46,000 ha. Three zones, namely core zone, buffer zone and experimental zone, have been established for the protection of CWD (Figure 2.3). The core zone of size 14,000 ha restricts vessel entry unless prior approval by the management department. The buffer zone of size 19,200 ha is located around the core zone and prohibits any tourism or commercial activities within the zone. The experimental zone, located on the edge of the PRECWDNNR with size 12,800 ha, allows local commercial activities and tourism. The Hong Kong International Airport Approach Areas (HKIAAAs) are located around the HKIA with the restricted access zones (Area 1 and Area 2) as shown in Figure 2.1. In accordance with the Shipping and Port Control Regulation (Cap. 313A) and Merchant Shipping (Local Vessels) (General) Regulation (Cap. 548F), certain vessels are restricted to enter or pass through the HKIAAAs depending on the location and vessel height. With the 3RS Project the restricted access HKIAAAs will be extended as proposed in Figure 2.1. The exact extent of the restricted access HKIAAAs will be examined during detailed design as well as the designation process under the relevant ordinances. Fishing vessels are not allowed to enter the HKIAAAs and hence these areas act as “fisheries no-take” zone which have minimal anthropogenic disturbance therefore promoting improved abundance and health of marine habitats / marine life. Connecting the 3RS Marine Park with the HKIAAAs is seen to be beneficial for providing additional linkage between marine protected areas and increasing the overall size of the interlinked protected area. Western Hong Kong waters are important for vessel travelling between Hong Kong and the western side of PRE, including Zhuhai, Macau and Guangdong. Urmston Road is an important navigation channel situated at the northeast of the 3RS Project between Lantau Island and Tuen Mun serving as a fairway for ocean-going cargo vessels, river-trade vessels, tankers, bulk carriers, high speed ferries and other craft. The Urmston Road remains as a key constraint in deriving the boundary of the 3RS Marine Park. In addition, a number of infrastructure developments are planned or underway in North Lantau waters, including the 3RS and the expanded HKIAAA, HKBCF, Tuen Mun – Chek Lap Kok Link (TM-CLKL), Hong Kong Link Road (HKLR), the proposed Tung Chung New Town Extension (East), and potential reclamation sites at Siu Ho Wan, Sunny Bay and Lung Kwu Tan. There are also contaminated sediment disposal facilities to the South of The Brothers and East of Sha Chau, shipping fairways and vessel traffic routes, anchorage areas, bunkering areas, mooring buoys, automatic weather stations and submarine utilities including cables, pipelines, seawater intake and effluent outfalls. Establishment of the 3RS Marine Park must take into account these existing or planned uses with a need to manage/minimise potentially conflicting uses. When determining the preliminary boundary for the proposed 3RS Marine Park, the ecological benefits of MPA connectivity for CWD conservation as well as the potential conflicts with existing and planned uses have to be balanced. Therefore, it is recommended that the proposed 3RS Marine Park shall be located away from the Urmston Road navigation channel with a buffer maintained between the proposed marine park boundary and the deeper part of Urmston Road, to allow safe passage of marine traffic. In addition, to strengthen ecological benefits of the proposed 3RS Marine Park, it is recommended to connect it with adjacent MPAs, including SCLKCMP and the planned BMP of Hong Kong as well as the PRECWDNNR of PRE. Extending the marine park boundary to the west of the expanded HKIAAA is also considered beneficial for CWD conservation and this should serve to further strengthen ecological connectivity with the known CWD habitats as identified in the EIA study. The preliminary boundary of the proposed 3RS Marine Park is about 2,400 ha in size, as illustrated in Figure 2.4. When the 3RS Marine Park is considered together with the current SCLKCMP and the latest BMP proposal, a total of 4,570 ha of MPA will be designated in North Lantau waters for the conservation of marine ecology and fisheries. Whilst the current proposal is to connect the 3RS Marine Park with the BMP, it should be noted that as the designation of BMP is underway, the exact boundary of BMP is yet to be confirmed. To effectively carry out the conservation objectives of the proposed 3RS Marine Park, a management plan is necessary for AFCD to regulate and monitor the activities inside the marine park. The management plan for the proposed 3RS Marine Park will be formulated in consultation with relevant stakeholders and advisory committees during the detailed study. The section below introduces potential management plan components and enhancement measures that are to be further investigated during the detailed study. · Ecological and environmental monitoring. Effective implementation of the management plan is key to the success of the marine park. A Liaison Group involving AAHK and the AFCD is proposed to be set up immediately prior to the operation stage of the 3RS Project to facilitate direct and ongoing liaison with AFCD with a view to adding value to the management of the 3RS Marine Park after its establishment. A zoning scheme is one of the effective management measures to define the activities that can occur within particular locations of a marine park. A diverse range of benefits and values of the marine park, including conservation, recreational, educational and scientific values could be protected under the zoning scheme. The zoning will be developed based on the latest findings of the marine ecological and fisheries studies as well as existing and commited marine uses. For example, the location and extent of core area(s) for the protection of CWD and their prey sources through prohibition of fishing activities will be further investigated during the detailed study. 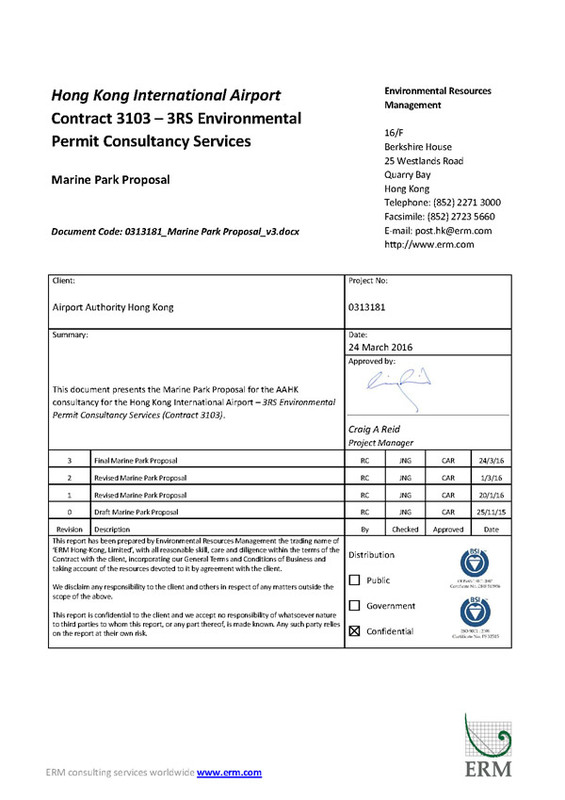 The recommendation to connect the proposed 3RS Marine Park to SCLKCMP and BMP to form a larger marine park matrix for better conservation of CWD and fisheries resources also presents an opportunity to explore integrated management of the three marine parks, hence developing holistic zoning schemes essentially for one large protected area. To effectively manage the three marine parks and carry out enforcement, it is considered that one single management plan could be implemented for the three marine parks with size-appropriate zoning management. The numbers of boundary buoys could also be reduced for easier management and safe navigation. The feasibility of integrated management will be further investigated through liaison with the AFCD and consultation with relevant stakeholders and advisory committees during the detailed study. To enhance the value of the proposed 3RS Marine Park, marine ecological and fisheries enhancement measures would be implemented to protect and enhance marine habitats and associated fish stocks through the following means. A review on relevant information including previous studies and surveys on fisheries for the marine park matrix (i.e. SCLKCMP, planned BMP and the proposed 3RS Marine Park) will be conducted to establish a fisheries profile within the matrix area. Based on the review results, field investigations, such as field surveys on fish resources and fishing operations, may be conducted if deemed necessary to facilitate the design of enhancement measures and the scope of the surveys will be determined during the detailed study. In addition, the AAHK will carry out feasibility studies on the potential enhancement measures to evaluate their suitability within the proposed 3RS Marine Park. Suitable enhancement measures recommended by the feasibility studies would be funded directly by the AAHK if determined to be feasible and to benefit marine ecological and fisheries resources. As proposed in the EIA, two potential sites located at the western side of the HKIA have been identified for potential artificial reef (AR) deployment as illustrated in Figure 3.1. A feasibility study on the AR deployment will be conducted under separate cover to investigate the value of ARs and the type / size of ARs best suited to western Hong Kong waters in terms of longevity and effectiveness. The two sites will be further evaluated under the feasibility study on their suitability. The study will also identify other feasible locations where hydrodynamic effect and wave action would be less significant and similar to the existing condition of western Chek Lap Kok waters to promote fisheries resources recovery. Following the recommendation of the feasibility study, ARs would be deployed around the 3RS Project Site to provide hard substrates for recolonisation of marine fauna that are expected to be beneficial to fisheries resources. Restocking of fish fry is another possible measure to enhance fish resources in North Lantau waters. Four potential locations have been identified for the restocking of fish fry within the proposed 3RS Marine Park during the EIA. Two of them situated at the east of Sha Chau and the north of the HKBCF are, however, not considered as suitable locations due to strong current flow along the Urmston Road and the lack of hard substrates (e.g. ARs) to provide refuge and shelter for fish fry / juvenile fish. The other two locations situated aside of the new potential AR sites at the western side of the HKIA are proposed as the potential locations for fish fry restocking as presented in Figure 3.1. A feasibility study on fish fry restocking will be undertaken under separate cover to investigate the value of fish fry restocking in western Hong Kong waters and explore the species and quantities of fish fry to be released and the suitable restocking time, frequency and locations, including an evaluation of the suitability of the two potential locations as shown in Figure 3.1. Following the recommendation of the feasibility study, fish fry restocking will be undertaken within the proposed 3RS Marine Park to enhance fish resources in North Lantau waters. Apart from deploying ARs and untertaking fish fry restocking, other enhancement measures will also be explored under separate feasibility studies within the proposed 3RS Marine Park to enhance its ecological and conservation values. The AAHK would initiate and fund such enhancement measures if determined to be feasible and to benefit marine ecological and fisheries resources. To better protect the CWDs and fisheries resources, further fisheries management measures listed below would be explored in consultation with relevant stakeholders and advisory committees during the detailed study. The AAHK will discuss with AFCD on the potential ways to assist in the implementation of the measures where possible for meeting the conservation objectives of the proposed 3RS Marine Park. · Voluntary Surveillance: to assign a surveillance team to monitor illegal activities and report to the authorities (e.g. Marine Police, AFCD) for law enforcement. The AFCD will be responsible for the operation and management of the proposed 3RS Marine Park after its designation under the Marine Parks Ordinance (Cap. 476). With the assistance of Transport and Housing Bureau, it is expected that the AFCD will allocate sufficient resources to ensure effective enforcement of the regulations stipulated under the Marine Parks and Marine Reserves Regulation (Cap. 476A). Marine park facilities are necessary to notify users regarding the relevant regulations and control measures. These may include, boundary lights buoys, marine park information boards / sign boards, which may be placed at prominent locations in the vicinity of the proposed 3RS Marine Park to demarcate the marine park boundary and zoning schemes. Figure 3.2 illustrates the indicative locations of the marine park facilities. To promote education and public awareness of the marine environment, educational materials (such as leaflets, exhibition boards, booths) will be displayed at visitor centres, public venues and schools, etc.. Other activities (such as eco-tours for the public and students, eco-guide training) will be organized to foster better public support for marine conservation. An education and publicity programme will be organized in collaboration with District Councils, non-governmental organizations and the tourism industry to promote the conservation of ecological resources as well as balancing the needs for development with nature conservation. The AAHK will collaborate with the AFCD in promoting education and public awareness of the marine environment, especially the western Hong Kong waters for CWD conservation. An environmental and ecological monitoring programme will be developed to evaluate the effectiveness of the marine park management plan. Monitoring components, including water quality, intertidal and benthic ecology, CWD and fisheries resources and fishing operations, would be considered within the proposed 3RS Marine Park and adjacent waters. Details on the monitoring programme will be further developed during the detailed study in consultation with relevant stakeholders and advisory committees. To ensure effective implementation of management plan and enhancement measures for the 3RS Marine Park, details on the management requirements, responsible parties and resource implications of the proposed management plan, enhancement measures and subsequent monitoring will be fully discussed during the detailed study. This Marine Park Proposal presents the preliminary proposed location, layout, size and management plan of the proposed 3RS Marine Park to be established for the compensation of the marine habitat loss associated with the land formation for the 3RS Project for protection and enhancement of CWD habitats within the areas. It should be noted that the preliminary proposed size of the 3RS Marine Park is provisional at this early stage. The exact boundary of the 3RS Marine Park shall be subject to further investigation in the detailed marine park study scheduled to commence upon approval of this Marine Park Proposal. Under the detailed study, consultations with the relevant stakeholders and advisory committees will be conducted and their views will be solicited before finalizing the marine park boundary and management plan. Further refinement on the boundary of the proposed 3RS Marine Park may also be made taking into account the information on CWD distribution (both historical and up-to-date recent data), key marine habitats and species, marine traffic, existing facilities and planned developments in the vicinity of the 3RS Project area available at that time. In addition, the boundary may also be adjusted in consideration of marine park operation and enforcement point of view. A tentative programme for the key tasks of the Marine Park Study is presented in Table 4.1. The AAHK will take the lead and work together with the AFCD in the preparation works for the designation of the proposed 3RS Marine Park. It is expected that a detailed study to finalise the marine park boundary and management plan be initiated in early 2016, with two rounds of stakeholder consultation planned to be undertaken in 2016–17. The two rounds of stakeholder consultation will be conducted to solicit views and comments from the fishing industry, green groups, non-governmental organizations, marine industry, marine users, boat operators, relevant District Councils, advisory committees (e.g. Country and Marine Parks Board, Marine Parks Committee, and Marine Department’s consultative committees such as Port Operations Committee, Local Vessel Advisory Committee and High Speed Craft Consultative Committee), community groups and Government departments. When preparing the stakeholder consultation programme, it is crucial to set the appropriate moment of the launch of each consultation activity and their sequence and assess the status of other concurrent developments in the surrounding waters of Lantau (e.g. consultation programme for the proposed marine park for the Integrated Waste Management Facilities (IWMF) Project at Shek Kwu Chau). The consultation programme will be further discussed with EPD and AFCD to ensure the consultations of 3RS Marine Park and IWMF Marine Park are separated. The latest desktop and field data, together with the comments from the stakeholder consultations would be taken into account for the Final Detailed Study Report to be prepared in 2018, followed by implementation of the necessary legislative procedures, such that the designation of the 3RS Marine Park will tie in with the full operation of the 3RS Project. Effective implementation of the marine park management plan is key to the success of the 3RS Marine Park. A Liaison Group involving AAHK and the AFCD is proposed to be set up immediately prior to the operation stage of the 3RS Project to facilitate direct and ongoing liaison between the AAHK and AFCD with a view to adding value to the management of the 3RS Marine Park after its establishment. () Appendix 13.16 to the approved EIA Report and Figure 2 of the EP No. EP-489/2014. () Hoyt E. (2011). Marine Protected Areas for Whales, Dolphins and Porpoises, Second Edition. Earthscan. () Hoyt E. (2009). Whale watching. In: Encyclopedia of Marine Mammals (Second Edition) (ed. by Perrin, W. F., Wursig, B. & Thewissen, J. G. M.), pp. 1223-1227. Academic Press.